Just a few miles northeast of Phuket is the star attraction – Phang-Nga Bay. Here are more than 100 islands with geology varying from low, gently sloping hills to the sheer-sided limestone sea mountains (karsts) that rise vertically out of the water to stunning heights. Images of Phang-nga and its steep, majestic and strange outcrops have travelled the world. While the bay itself is not large, the number of islands, inlets, mangrove channels and sea caves to be explored ensures that no matter how long a yachtsman spends here, new experiences will always be around the corner. Day One: Phang Nga Bay: Spectacular limestone cliffs towering out of the sea, sea eagles dropping out of the sky swooping on their prey, calm waters, pristine nature, fantastic kayaking through caves and inland lakes, local fishermen selling freshly caught seafood, just a few reasons why one has to visit the Phang Nga Bay. 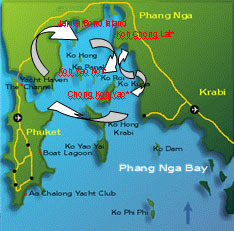 Day Two: Anchor out Koh Pak Bia for it’s pretty beach and sail to Ao Nang, Krabi. Many argue that Krabi’s beaches, backed by dense rain forest, are amongst the most beautiful in the world. One of Thailand’s best kept secrets, Krabi is undergoing an awakening. First discovered by cruising yachtsmen and travellers – and remaining sleepy for many years – it now hosts bungalow resorts, top international hotels and numerous restaurants. Day three: Pass through the Koh Dam group with Chicken Island, enjoying the spectacular snorkeling, and arrive at Phi Phi Islands. One of the most renowned island in the area, Phi Phi has everything. Awe-inspiring scenery, great diving, clear waters, secluded bays, white sandy beaches, jungle trails and great game fishing… Combine with great shopping, restaurants catering to all tastes,bars and live entertainment. Day four: Visit Phi Phi Don and Phi Phi Ley and do not miss Maya Beach, famous for the movie “The Beach” with Leonardo di Caprio. Day Five: Koh Rok Nok. Marine National Park, Koh Rok Nok islands are totally uninhabited and a great snorkeling location. Day Six: Sail to Koh Racha, Spend the night at the spectacular anchorage – a very beautiful beach and great snorkeling location. Day Seven: Back to the Phang Nga Bay, stopover at the Kho Yai islands, where the yachts anchor out one of the secluded resorts, “Evason” or “Paradise”, and take the opportunity to experience the renowned Spas and Thai massages . Day Eight: Sail to Yacht Haven Marina to disembark. The marina is located at a 15 minutes drive to the International Airport. A yacht charter vacation to the exotic South East Asia is time of your life experience.